It is extremely difficult to remain idle. In order to master the art of idling, great skill, patience, and dedication are required. Time and time again, the natural tendency to movement reasserts itself. The body, in spite of itself, will be propelled forward into action once more. Or, more disconcertingly, it will be thrown backwards, so that all balance is lost. Just at that moment when one wants to be rooted to the spot, to not move, to go nowhere, one is uprooted, turfed out, moved on, or sent on one’s way. In effect, it’s only possible to succeed at becoming truly idle through hard work. It is a work that engages the whole body and uses every muscle. The greatest amount of effort is expended through the core of the body. In order to stay just where you are it is necessary to relax and tense your stomach muscles in just the right way. The legs and arms also come into play. When you’ve finished being idle you’ll probably need to go and have a sit down. Idling really is an exhausting activity. I should explain that ‘idling’ is the name given to the technique in unicycling where the rider rocks back and forth without really going anywhere. It is that series of small shifts and movements used by performers when they want to remain pretty much in one place – whilst juggling for instance, or whilst they talk to their audience. The wheel is pushed forward a quarter turn or so and then rolled back, so that the tyre treads its ways over the same piece of ground. Idling is a prodigiously difficult skill to master. It is far harder, in fact, than simply getting onto the unicycle in the first place. It is certainly more challenging than riding around on it. I should know: I’ve tried to become idle for the last few years and – much as it might surprise some people to hear it – have still not really managed it. I was given my unicycle as a Christmas present. For years, whenever I had seen someone riding one I had joked that I’d like to have a go. I made these comments safe in the knowledge, or so I thought, that I wouldn’t ever have to attempt unicyling for real. However, I was taken at my word, and was presented with a large box containing a shiny red unicycle one Christmas morning. As a gift idea it was certainly a pedal stroke of genius and one that called my bluff. The winter weather ensured that I didn’t have to practice straight away. 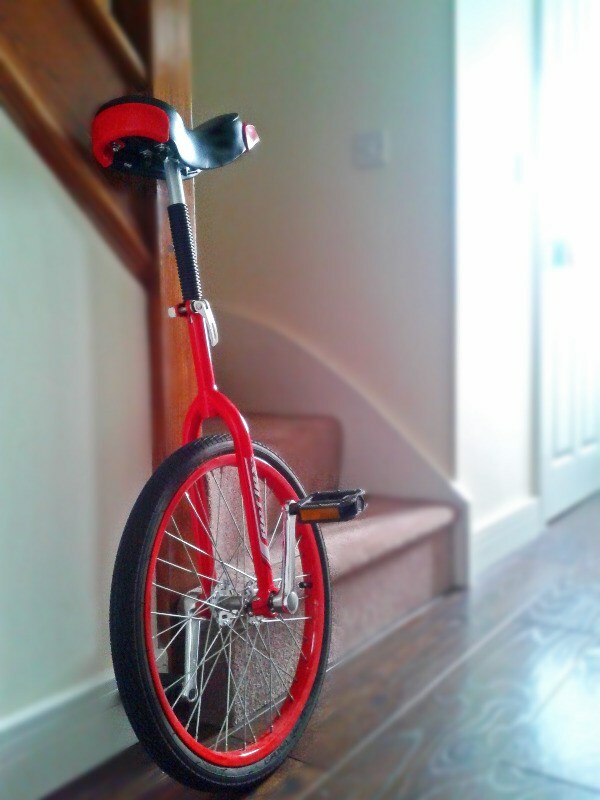 For several weeks the unicycle itself stood idly in the hallway, propped against the bannister. However, when the sun finally came out I too was forced out into the garden. I took a deep breath, gripped the fence tightly and made my first attempt at hauling myself onto the contraption. After several hours practice I was able to execute this manoeuvre without the wheel immediately rolling out from underneath me. I could then push away and head across the patio to the fence and flowerpots on the other side. The growbag acted as a convenient brake on occasion. The next step was to move from the back garden to the front, and to the driveway. Here, I didn’t have any convenient prop to help steady myself. Nevertheless, I gamely threw myself forward and, to my surprise, found myself riding along. Admittedly, I was also circling my arms frantically, like a bird thrown out of the nest flapping its wings in a desperate attempt to take flight. But at least I was doing it. It is the forward momentum that helps to keep the unicycle rider vertical. In this respect he or she is no different to a normal bike rider. All the time I was moving forward, my eyes fixed on some distant object and my feet turning a regular cadence, I was fine. I even managed to become somewhat stable. However, every time I tried to stop, or to kick the wheel back, I came a cropper. Nor did any amount of practice seem to make a difference. I would go out each morning full of determination. ‘Today’, I said to myself, ‘I will succeed in travelling over the same old ground. I will become idle.’ I leant against a lamp post for balance; I tried to stop mid journey, push the pedal back and then continue on my way; I tried to get onto the unicycle and immediately start to rock. Only nothing quite worked. In the bright spring sunshine these ridiculous attempts to become idle caused me to sweat wildly. I got bruises on my legs from gripping the saddle so tightly. To this day I’ve not mastered the skill of idling. There is, I now know, an art to going nowhere. It is one at which I’ve not yet become proficient. However, I’m sure that if I work hard enough and practice long enough I will master it. And from that day onwards I will be able to idle away my time contentedly.